“Music for a Darkened Theatre” highlights the October Halloween season with thrillers and chillers like Johan De Meij’s “Lord of the Rings (Excerpts from Symphony No. 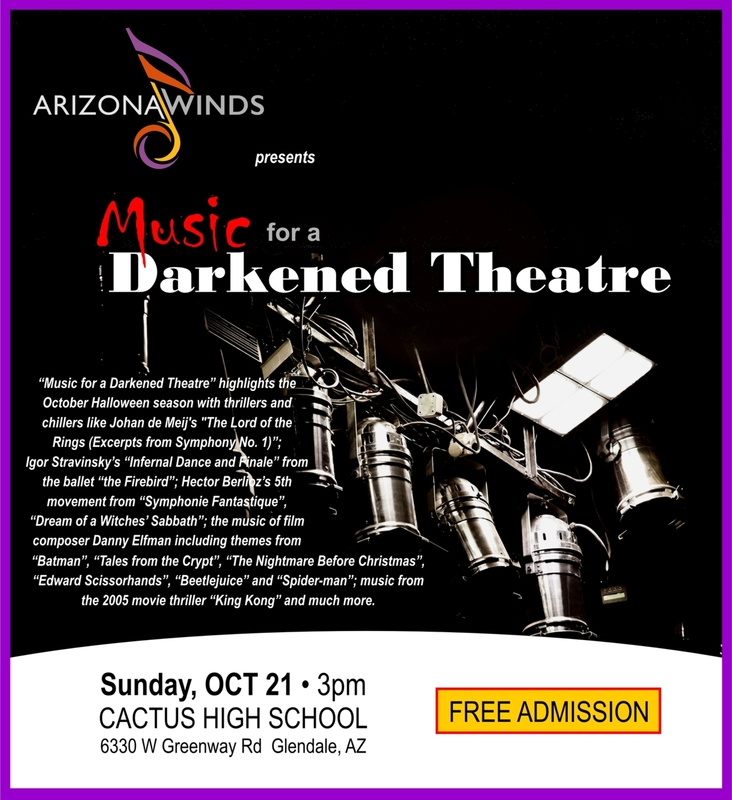 1)”; Igor Stravinsky’s “Infernal Dance and Finale” from the ballet “the Firebird”; Hector Berlioz’s 5th movement from “Symphonie Fantastique”, “Dream of a Witches’ Sabbath”; the music of film composer Danny Elfman including themes from “Batman”, “Tales from the Crypt”, “The Nightmare Before Christmas”, “Edward Scissorhands”, “Beetlejuice” and “Spider-man”; music from the 2005 movie thriller “King Kong” and much more. 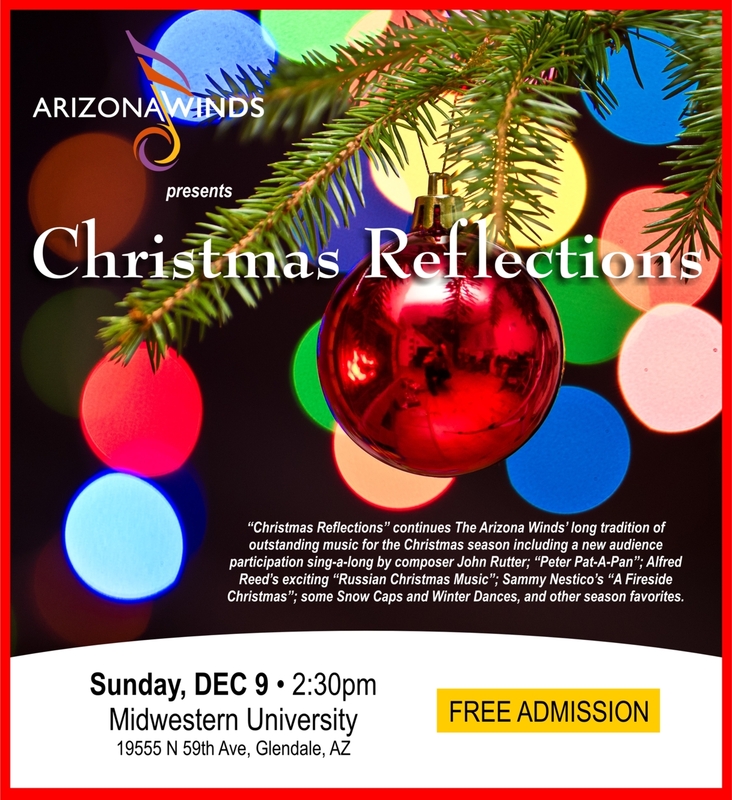 “Christmas Reflections” continues The Arizona Winds’ long tradition of outstanding music for the Christmas season including a new audience participation sing-a-long by composer John Rutter; “Peter Pat-A-Pan”; Alfred Reed’s exciting “Russian Christmas Music”; Sammy Nestico’s “A Fireside Christmas”; some Snow Caps and Winter Dances, and other season favorites. 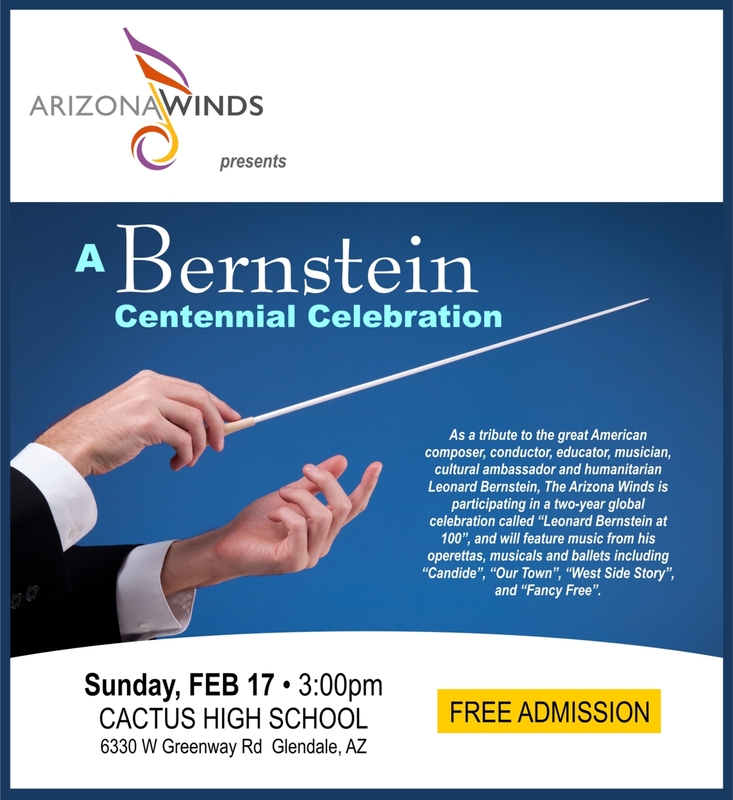 As a tribute to the great American composer, conductor, educator, musician, cultural ambassador and humanitarian Leonard Bernstein, The Arizona Winds is participating in a two-year global celebration called “Leonard Bernstein at 100”, and will feature music from his operettas, musicals and ballets including “Candide”, “Our Town”, “West Side Story”, and “Fancy Free”. “April showers bring May flowers”, so the band’s April theme “Water Works” seems appropriate. 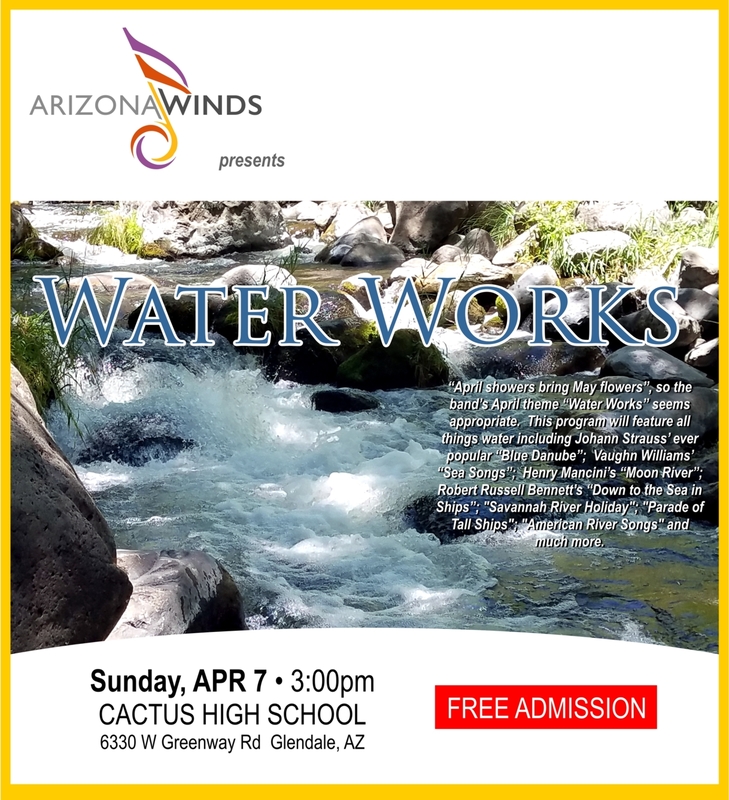 This program will feature all things water including Johann Strauss’ ever popular “Blue Danube”; Vaughn Williams’ “Sea Songs”; Henry Mancini’s “Moon River”; Robert Russell Bennett’s “Down to the Sea in Ships”; “Savannah River Holiday”; “Parade of Tall Ships”; “American River Songs” and much more. 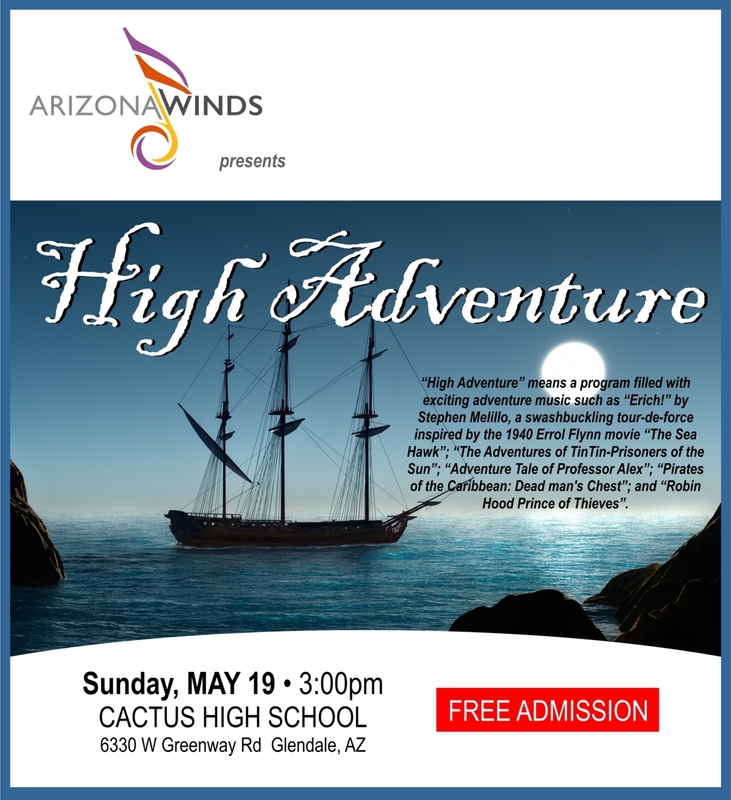 “High Adventure” means a program filled with exciting adventure music such as “Erich!” by Stephen Melillo, a swashbuckling tour-de-force inspired by the 1940 Errol Flynn movie “The Sea Hawk”; “The Adventures of TinTin-Prisoners of the Sun”; “Adventure Tale of Professor Alex”; “Pirates of the Caribbean: Dead man’s Chest”; and “Robin Hood Prince of Thieves”. Support the Band & Donate Today!